Emulate your existing LaserJet, Inkjet printer, or MFP device into an IPDS capable printer that fully supports the IPDS protocol.Using this software emulation solution for IPDS printing, users can print reports of IBM IPDS data streams produced from a wide range of systems such as AS/400-i series IBM power- and mainframe-systems with a resolution up to 600 dpi, plus seamless emulation switching. Users also get tray and binmapping and integrated-solution support features. Virtual IPDS Printer, as its name indicates, is a pure software emulation solution for IPDS printing, which translates Intelligent Printer Data Stream directly into common printer languages eliminating the need for expensive investment on specialized hardware, extra software, and major reprogramming on the host side. 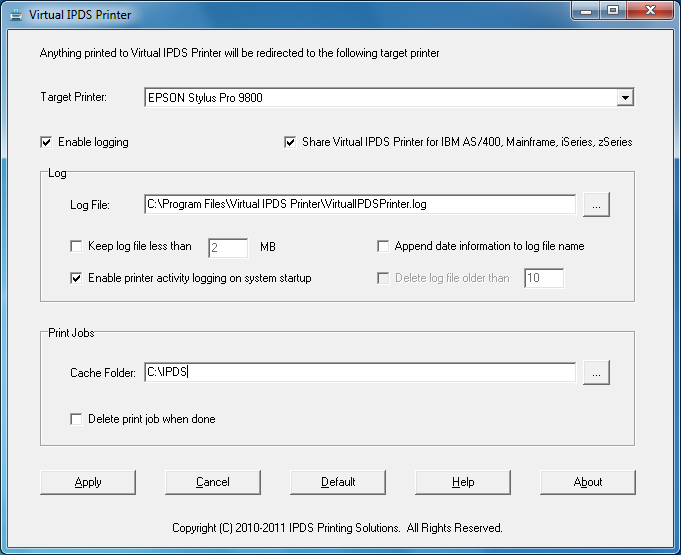 The Virtual IPDS Printer software installs a printer namely Virtual IPDS Printer to your printer list, and it enables fast and flexible printing from mainframe, midrange and other non-Windows host systems - such as UNIX, AIX, AS/400, IBM Power Series, System z, and Linux - to any Windows-based printers. Easy to install and integrate, Virtual IPDS Printer simplifies cross-platform printing and central management of print jobs. With the help of IPDS to PDF (Portable Document Format) converter plug-in, users can print AFP/AFPDS/IPDS to PDF files without difficulty, thereby conserving bandwidth, and promoting fast transmission of print documents for previewing, printing and archiving. Organizations using Virtual IPDS Printer will gain the benefits of increased efficiency, productivity and reduced cost. Car Salesman Organizer Pro: simple database management system that helps car sales people to organize, manage, and track prospects, leads, and clients. Pdf password restrictions removal software enable pdf print button and instantly allow printing of document. It not only remove open password but also unlock pdf protection to permit pdf editing, content copying, signing, form filling&commenting. Topalt Email templates for outlook is an easy hassle free and time saving program. This program will install a plugin in your outlook which will allow you to insert templates on a variety of topics.